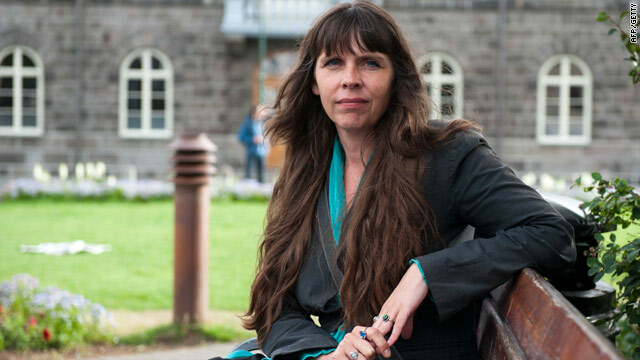 Birgitta Jonsdottir: Says the U.S. justice department has asked for her private Twitter messages to be handed over. (CNN) -- U.S. officials have subpoenaed information on the social media website Twitter about Julian Assange and several other prominent supporters of WikiLeaks, an Icelandic lawmaker named in documents said Saturday. A federal court in Virginia has ordered Twitter to provide information for each account registered to Assange, U.S. Army Pfc. Bradley Manning, Rop Gonggrijp, a reported computer hacker from the Netherlands, and Birgitta Jonsdottir, a member of parliament in Iceland and a former volunteer with WikiLeaks, according to documents sent to CNN by Jonsdottir. The order asks for subscriber names, user names, screen names, mailing addresses, residential addresses and connection records along with other information related to the accounts. CNN could not independently verify the documents. Justice Department spokesman Charles Miller would not comment on the matter. Jonsdottir, who met Assange a year ago and worked with WikiLeaks until last summer, called the U.S. demand for private information "unacceptable" and said she is consulting with lawyers in the United States on how to respond. She said she had no idea why her Twitter account was of interest. "I hope they don't think I am so naive that I would be doing any sort of messaging through the Twitter board of any significance or (that would be) incriminating," she said. "This shows how nervous the U.S. government is," she said. "I think this should be handled better. I have done nothing illegal." Jonsdottir said the Twitter legal team sent her an e-mail at 7:30 p.m. Friday informing her that the company would respond to the U.S. order in 10 days unless it received notice that a motion had been filed to quash the legal process. Gonggrijp also posted the notification he received on his website. "We are writing to inform you that Twitter has received legal process requesting information regarding your Twitter account @birgittaj. The legal process requires Twitter to produce documents related to your account," the notification said, according to Jonsdottir. Twitter spokeswoman Carolyn Penner said she would not speak about the specifics of the WikiLeaks case. "We're not going to comment on specific requests, but, to help users protect their rights, it's our policy to notify users about law enforcement and governmental requests for their information, unless we are prevented by law from doing so," she said. "We outline this policy in our law enforcement guidelines." The court documents provided by Jonsdottir show that the original order for Twitter to supply the information was given on December 14 and sealed. Judge Theresa C. Buchanan unsealed it January 5, authorizing Twitter to disclose the order to its subscribers and customers. Jonsdottir posted a string of messages on Twitter on Saturday regarding the subpoena. One, posted just before 7 a.m., said: "Talked with the Icelandic minister of Justice -- he is now looking into the case of demands of DoJ wanting my twitter details." Jonsdottir was once a spokeswoman for Wikileaks and worked on the website's release of a classified video last April that showed a U.S. Apache helicopter firing at and killing civilians -- including two Reuters news service journalists -- on the ground in Iraq. WikiLeaks said the video "clearly shows the unprovoked slaying of a wounded Reuters employee and his rescuers." Public airing of the video forced the Pentagon to defend the actions of its troops in a report that concluded the Apache crew had no way of knowing the journalists were among suspected insurgents on the street. Recently WikiLeaks has been publishing hundreds of thousands of pages of confidential U.S. military and diplomatic documents. In late November, Attorney General Eric Holder said the Justice Department is conducting an "active, ongoing criminal investigation" into the WikiLeaks disclosure of secret U.S. diplomatic documents. Manning is under arrest for leaking the Apache helicopter video and is the suspected leaker of the cables and other documents relating to the wars in Iraq and Afghanistan. "If he did indeed leak it, I consider it to be a citizen responsibility," Jonsdottir said, adding that she is concerned about Manning's condition in solitary confinement. WikiLeaks' editor Assange is currently free on $310,000 bail but wears an electronic tag while he is fighting extradition to Sweden where prosecutors want him for questioning in connection with sexual misconduct allegations. Profiles written about the once-elusive Assange say he keeps a residence in Iceland, where WikiLeaks web servers are reportedly located. Jonsdottir recently sponsored legislation that helped strengthen Icelandic laws to protect anonymous speech like that promoted by WikiLeaks. Jonsdottir said Washington was looking for ways to have Assange extradited to the United States. She said she has been invited to speak at a conference on freedom of information in Florida in June but is fearful of being treated like a terrorist. America, she said, has always prided itself on being a nation of individual freedoms. But the reaction to WikiLeaks has called that into question, she said. CNN's Talia Kayali and Moni Basu contributed to this report.